As design plays a major role in attracting your customers to subscribe to your website’s newsletter, we have made sure to give the Prestashop newsletter popup module a stunning overall design and customization features. 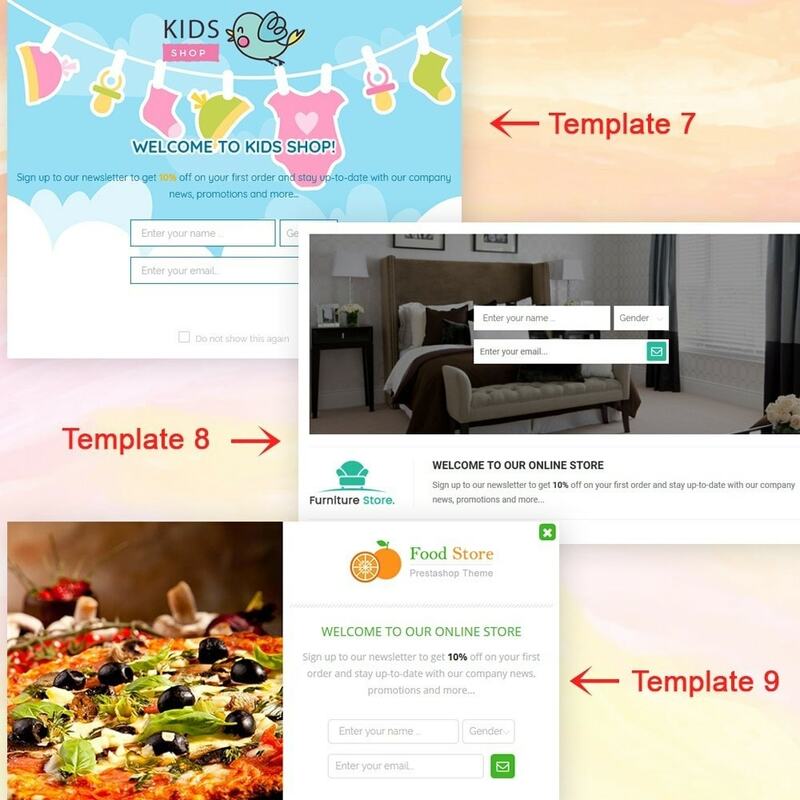 9+ amazing pre-defined Prestashop newsletter popup templates are offered in the module, to choose from according to user requirements. With each template having different but beautiful designs, there’s bound to be one to suit your website regardless of its type. 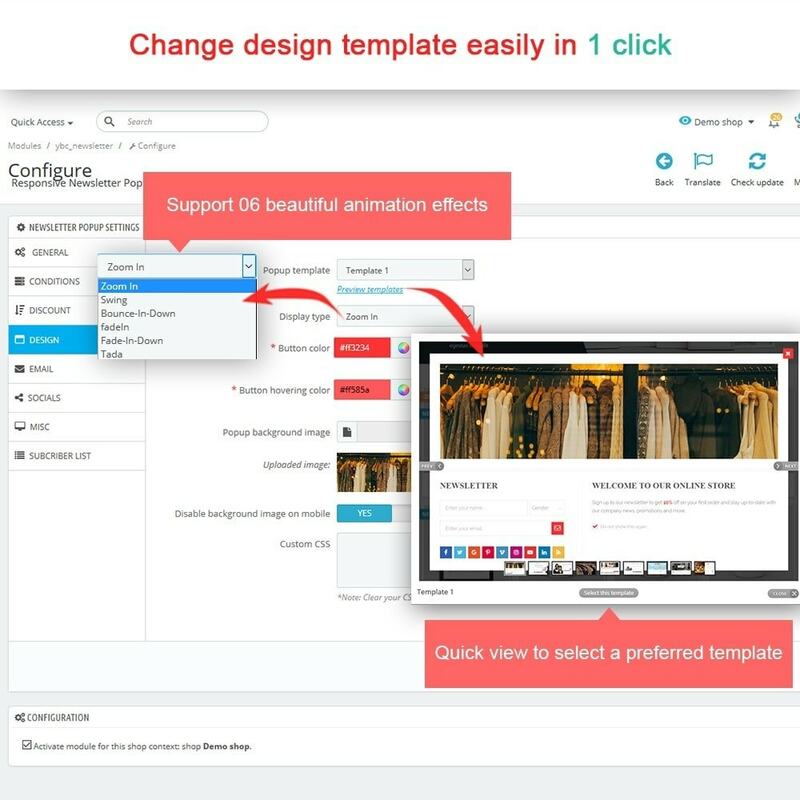 You can quickly browse through the templates using template preview features and select a popup template suitable for your website. 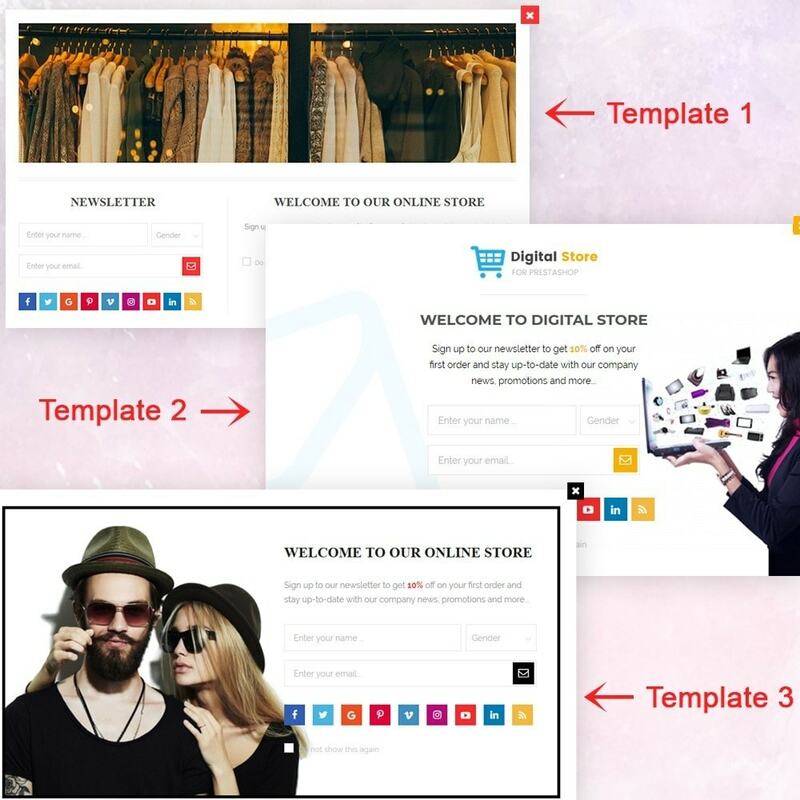 Customization of the available Prestashop newsletter popup templates to create your own beautiful template is also possible with the Responsive Newsletter Popup module. You can use the features html editor, short codes, custom color, custom CSS, custom images etc. for the customization of the Prestashop newsletter popup interface. 6+ beautiful animation effects enhance the beauty of the newsletter popup by providing different ways for the popup to appear in the frontend. Zoom in, Swing, Fade in are some available animation effects available in the Prestashop newsletter popup module. The Responsive Newsletter Popup module is fully responsive just like the name states and can be displayed perfectly on screens of any dimension. The user also has the option in the backend to disable displaying the newsletter popup when the website is viewed on mobile devices. 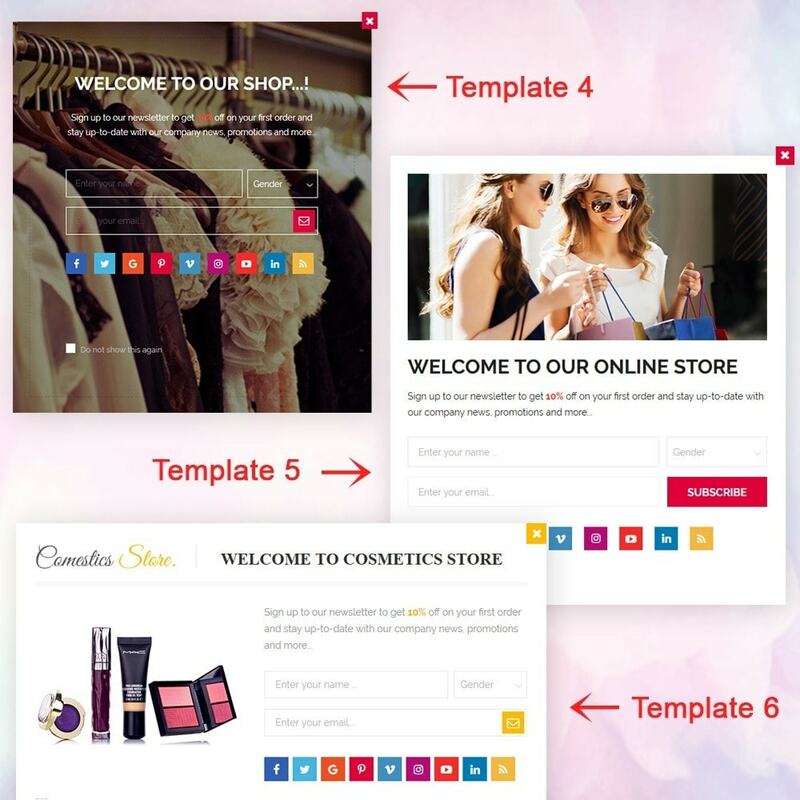 Responsive Prestashop newsletter popup excels not only its amazing design but also the powerful modules and advanced features it offers to the user. The customization features available in the backend for the website owner as well as the features offered in the frontend for the website’s customers in combination gives a great module with great features. Time options: This option can be used to control many time aspects of the newsletter popup such as the display time of the popup, display duration and the frequency of duration. The decision on when the popup is to be displayed first can be provided by giving a value in milliseconds for Delay start while the popup display duration and the gap between two popup displays can be provided in minutes. The user also has the option to turn or off the ability to end popup lifetime when the popup is closed by customer. Popup available date: You can set the time range for popup display to suitable with your online store marketing campaign. Custom content: The content or the messages displayed when interacting with a popup is not the same for all websites. Therefore the Responsive Newsletter Popup gives the option to provide user-defined content and messages for the newsletter popup. 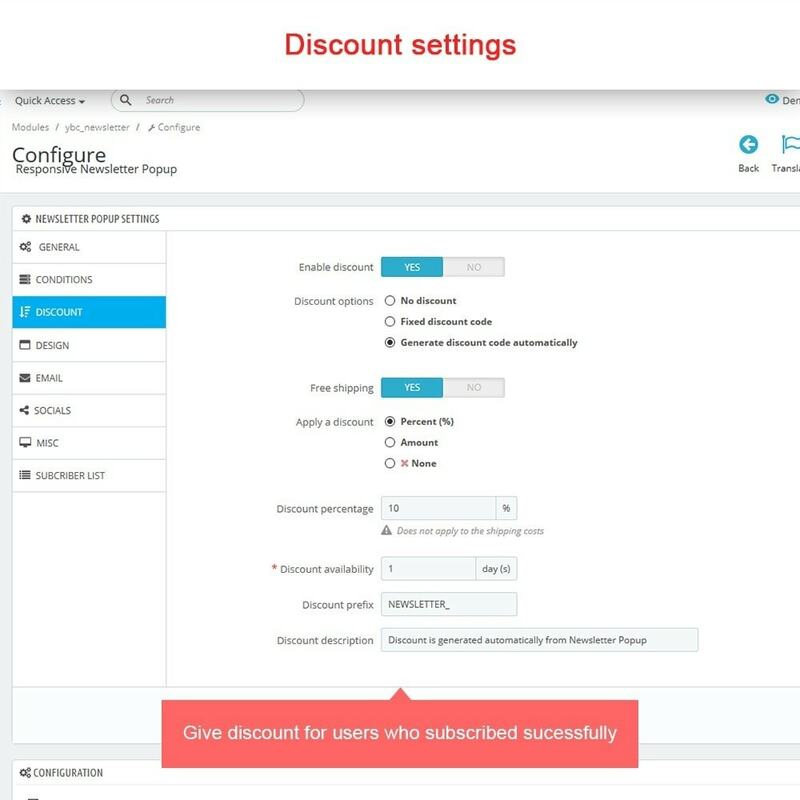 This option also helps you add custom voucher codes easily when needed. Automatically generate discount code: our Prestashop newsletter popup module can help you create custom discount code which you may adjust its value, availability, prefix and description. Support Thank You Message Design tool: The message displayed once a user successfully subscribes to the website’s Prestashop newsletter can also be custom designed. 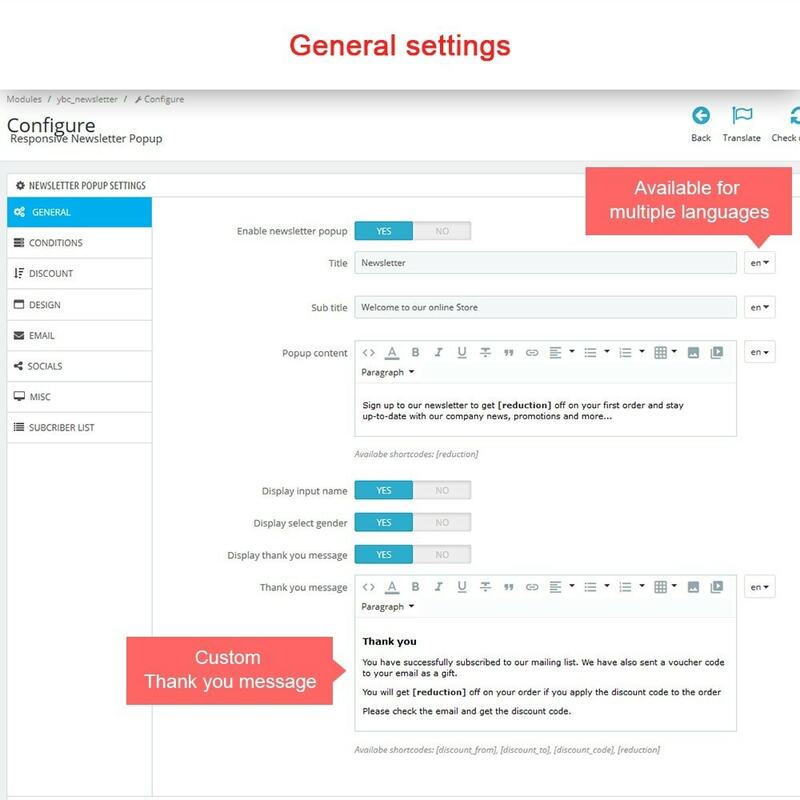 In addition to the custom content, the message interface can be customized using the color picker, custom logo, and custom CSS options provided. Social Network: Providing links to social media pages related to the website such as Facebook, Instagram, Twitter etc. 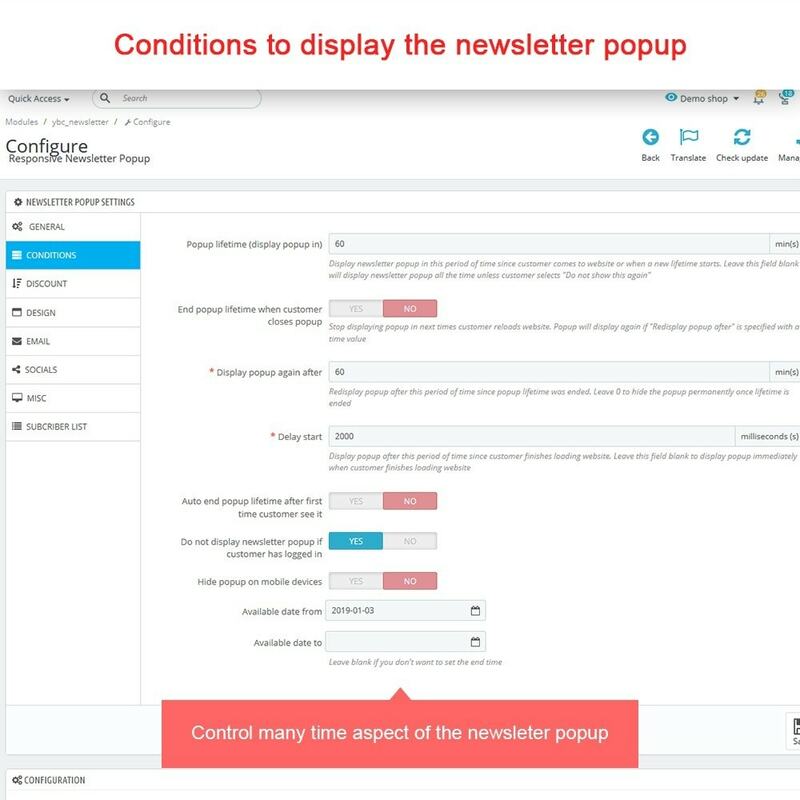 in the pop-up interface is a great way to get your users to visit those pages to get a better idea about the products prior to subscribing for the newsletter. 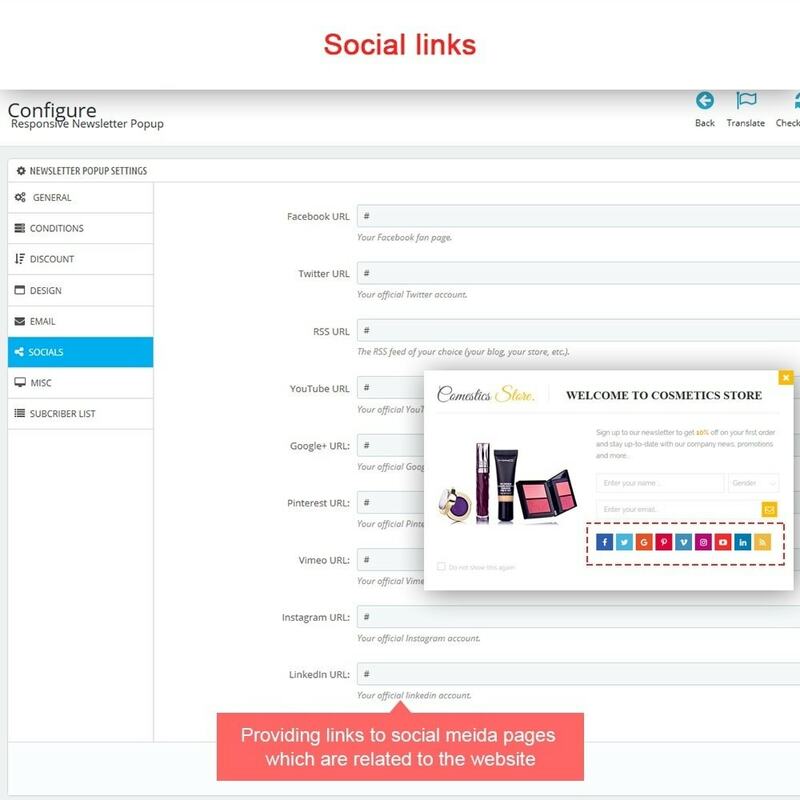 The social network links are provided hyperlinked to icons grouped attractively on the popup. 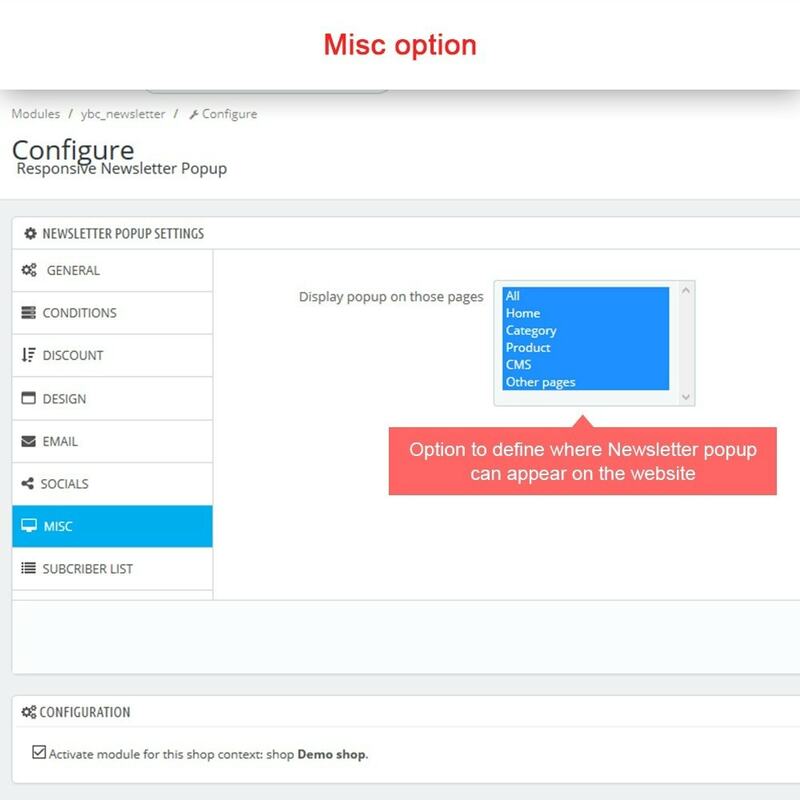 MISC Option: This option defines where the Prestashop newsletter popup can appear on your website. The website owner can specify either the homepage or any other page as preferred. Export Option: The database of customers subscribed for the newsletter may have uses for the website owner even external to the website. The export option fills this gap by providing the opportunity to export a .csv file containing all details. 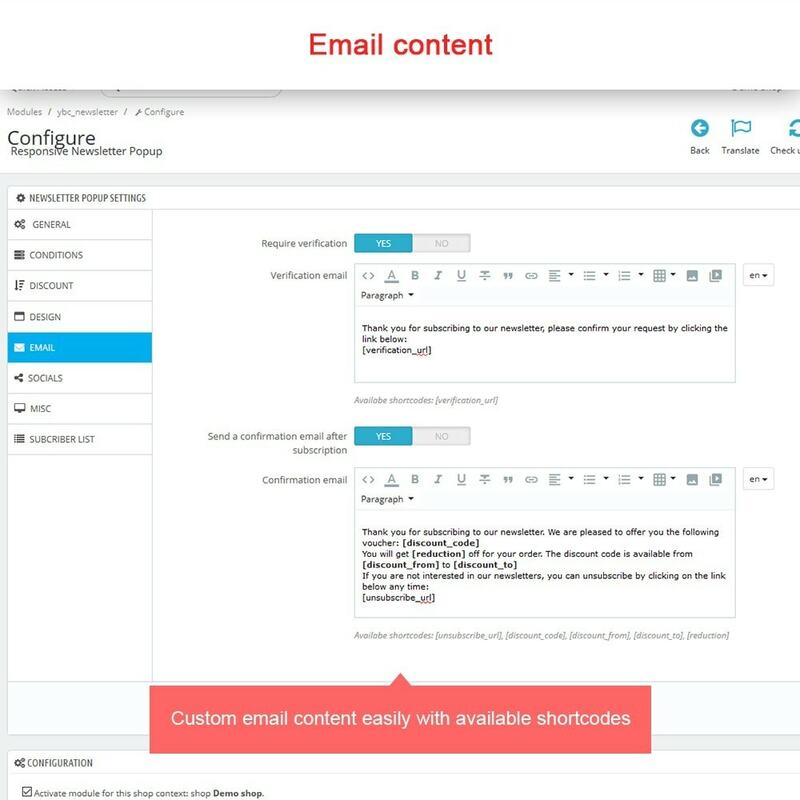 Emails are a vital part of a subscription confirmation in a popup. Verification and confirmation emails are sent by the module automatically to the subscribed user. Responsive Prestashop newsletter popup module supports sending both verification and confirmation emails to the customers upon subscription. Unsubscribing to the service and verifying the subscription are also two features provided for the customers via email. 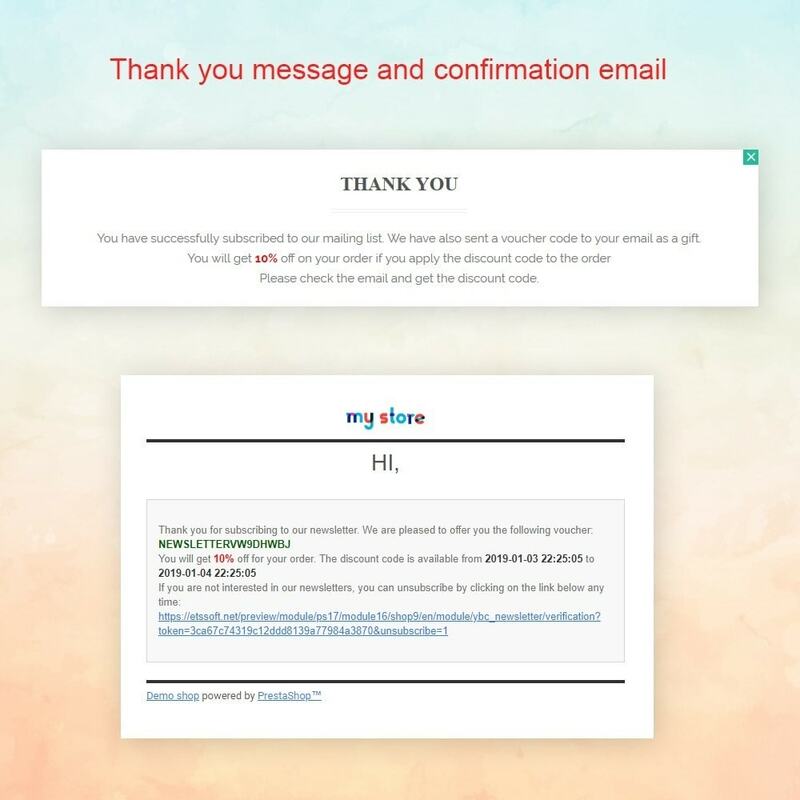 A link is provided in the verification email to verify the subscription of the customer while a unsubscribe link is provided in the newsletter emails for easy one-click unsubscribing. As Prestashop comes with a default newsletter system, our Prestashop newsletter popup module works parallel with and synchronizes all details to the default system. The subscription email addresses of the customers received are saved to the default Prestashop subscription table. The Prestashop newsletter popup also allows for centralizing the customer database. All the default newsletter popup features are also available with the module to be used alongside the new features. To help you easily manage your online store subscribers, Responsive Newsletter Popup offers a detailed list with subscriber’s general information. You can export this list to create a backup or transfer it to another store for marketing purpose. Mailchimp is an always-on marketing platform for small businesses. It makes innovative, beautiful products that empower those businesses to find more customers. Today, Mailchimp serves millions of customers around the world and is one of the most popular marketing platforms for online store owners. 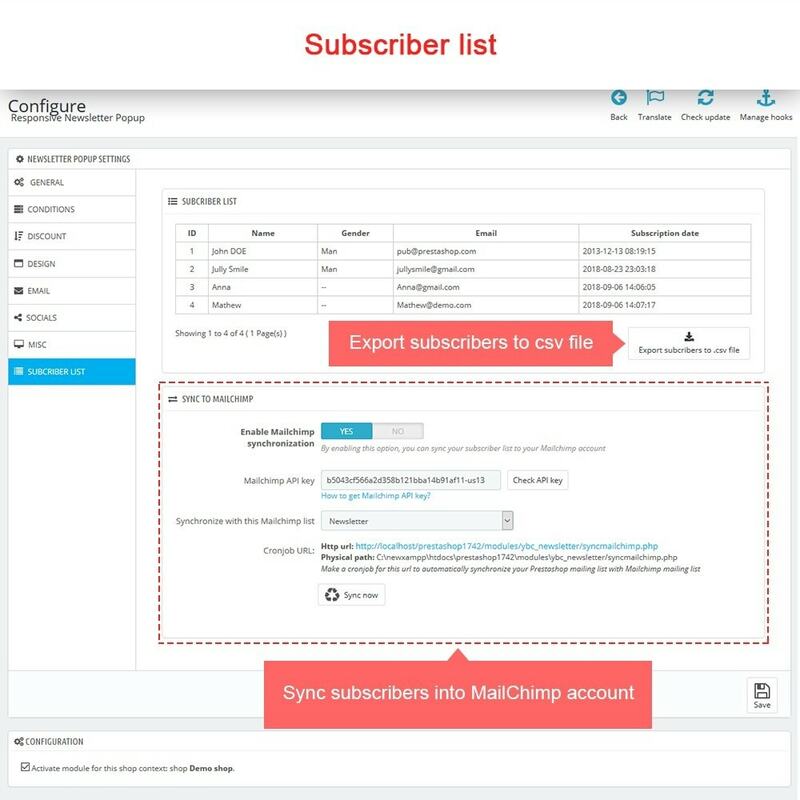 Our Prestashop newsletter popup module also supports synchronization with Mailchimp to help you sync your subscriber list to your Mailchimp account. All you need to do is insert Mailchimp API key and we’re ready to go! 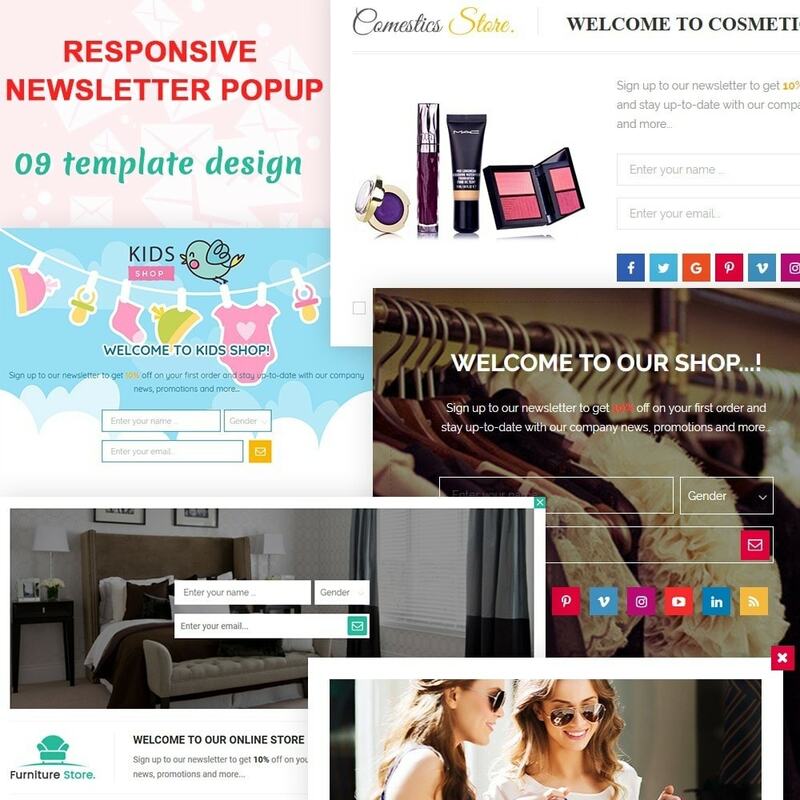 Responsive Prestashop newsletter popup module offers a large number of amazing features for the benefit of website owners to lure customers to subscribe for the website’s Prestashop newsletter. These features make it easier for the user to bring out a Prestashop newsletter popup of its own identity based on user requirements. Responsive newsletter popup is 100% open source, you can easily make customization to the module if you have basic code knowledge. A well-documented user-guide is also included with the download package. Responsive newsletter popup is strongly compatible with any Prestashop website even when your website has custom themes and modules installed. Works perfectly on any kind of end-user browser: Google Chrome, Mozilla Firefox, Opera, Safari, Internet Explorer, Microsoft Edge etc. Free installation service is also included, don’t hesitate to contact us for help if you get any problem when installing this module on your website. Customer can easily subscribe to your website mailing list using beautiful newsletter popup interface selected from 9+ pre-defined newsletter popup templates. Jquery Ajax is fully implemented on the module frontend to make sure customer can subscribe to your newsletter without having to reload the web page. This brings the best experience for customer when they subscribe to your newsletter. Boost your customer mailing list, it’s important channel to operate your marketing campaigns and it will also boost your sales. If you see any bugs with the module, please contact us for support. We’ll fix the bug free for your website immediately and update the module to a better version without the bugs. Module is really great. I had some problem due to my server configuration but the developper team help me to solve the problem really fast. I studied many popup newsletter modules, this is the most effective and concise. It perfectly integrates the default newsletter system. Thank you for your patient and support!